Two decades before adults had to fear Children of the Corn, there were children of the village to worry about! I take on the Village of the Damned movies, and as a bonus, I throw in Wicked Little Things. 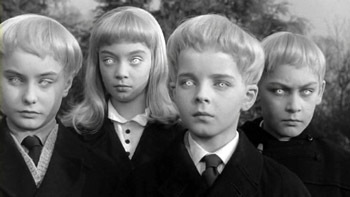 Village of the Damned is based on the novel The Midwich Cuckoos by John Wyndham, who also wrote the novel upon which The Day of the Triffids was based. When a whole town of people suddenly passes out, the military is called in (ugh!) to investigate. While no apparent cause is determined for the incident, pretty soon, all the woman of birthing age are pregnant—and give birth to children who grow at a rapid rate. They are all brilliant, have emotionless eyes and platinum hair, dress the same, stay together all the time—and read minds. They can also use their minds to get people to do things. Naturally, these evil brats start making people kill themselves. 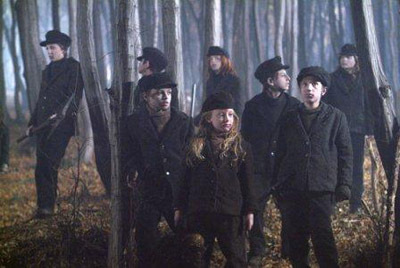 They really are some of the creepiest evil children ever in a horror movie. Their blank stares and white glowing eyes are terrifying. And it seems like there’s no way to do away with them since they can read your every thought. But one man has a plan. 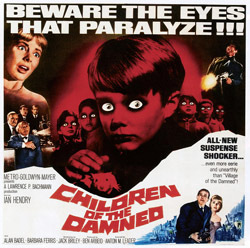 There’s one cool, scandalous thing Children of the Damned explores that the original film glossed over. The mothers of the children in this film are virgins. Other than that, this one is so heavy on military plot. First, scientists have to hunt down the kids who are part of this phenomenon of brilliance and that takes forever. The rest of the movie is a long boring study of the kids while the military makes plans to destroy them. Yawn. It has none of the creep factor of the original film. On a positive not, the children are a very diverse group for 1964. 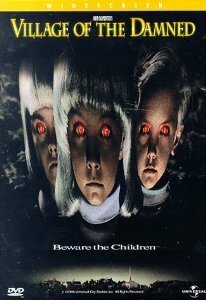 The idea of horror master John Carpenter remaking Children of the Damned after what he did with The Thing sounds awesome. I love how the movie opens with “voices” crossing the water toward the small town—it’s a genuinely creepy representation of the children approaching as everyone passes out. Not to mention, we get to see Michael Pare shirtless and Christopher Reeve looking amazing in only his tighty-whities in the first five minutes. Plus, John Carpenter gave Mark Hamill another horror job. Kirstie Alley also stars in a rather campy role as a scientist who steals one of the stillborn babies and keeps it in a jar…where it turns into your basic everyday alien. You’d think Carpenter would make the film much scarier, but that’s not the case. The deaths may be a little more gruesome, but the children feel so over-the-top there almost cartoonish in this one. And their eyes don’t only glow white, they turn a rainbow of different colors, pushing the movie into cheesy sci-fi flick territory. There are a few alterations in the plot. The government is willing to pay for the children to live if the women decide not to abort them—and offer to pay for abortions if they decide to get rid of them! Holy controversy. Speaking of holy controversies, the virgin birth plot from Children of the Damned makes an appearance here. And also, one of the boys becomes more and more human and expresses emotions the others don’t. None of that helps make it a John Carpenter masterpiece. 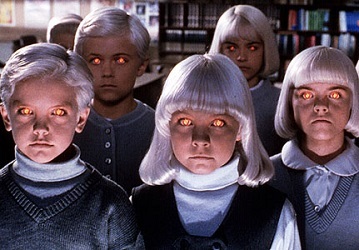 Unrelated to the Village of the Damned movies, Wicked Little Things still has something in common with them. Evil little kids who all dress the same and have creepy eyes (only this time they are black instead of white) terrorize a town. A mother and her two daughters come to live in the house she inherited from her dead husband’s family. They’re a nice little trio of scream queens: Lori Heuring (Prom Night remake, Hunger, Within), Scout Taylor-Compton (Halloween remake, April Fool’s Day remake, Life Blood) and Chloe Grace Moretz (The Amityville Horror remake, Room 6, Carrie remake). And they all seem to sense they’re in a horror movie from the very beginning. Mom decides to stay anyway, even though: there are loads of “missing” flyers in the local convenience store; she almost hits a creepo walking across a deserted road on the way to the house; there are what look like blood marks on the front door of their house; there’s no electricity or water; there’s a creepy doll on her daughter’s bed; there are rats; there are clipping about children who died in a mine shaft in her basement; she dreams about being killed by a kid with a pick axe on her first night; she goes downstairs after waking from the dream and the front door is open with fresh blood on it and there’s someone walking away from the house into the woods. This is on the FIRST DAY THERE. The plot is all over the place. Scout makes some obnoxious teen friends, which you know means there’s going to be a slasher-esque body count. Chloe takes off into the woods and finds a mineshaft, and says she talks to a girl named Mary (why does the name Mary get such a bad rap in horror?). Some weird dude is painting blood on everyone’s doors and sacrificing pigs to the children. The children are ghosts, I guess, but they walk around in physical form and hack everyone up with pick axes—and eat flesh. And suddenly, out of nowhere, more than halfway through the movie, Mom meets this bitchy guy who says he owns all the property around the area, including the house she just inherited and wants her out. Only then do the ghost kids become more selective about who they want to kill. It seems they want him—after chasing mom and her kids endlessly and leaving a pile of bodies behind. Only once the threat is gone does mom decide to get her daughters the hell out of there, promising them that their friend the door painter will take care of loose ends. LOOSE ENDS? You came to town for a few days and left like half a dozen dead bodies behind! 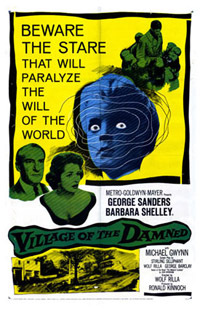 This entry was posted in Movie Times & Television Schedules - Staying Entertained, The Evil of the Thriller - Everything Horror and tagged Children of the Damned, John Carpenter, slashers, Village of the Damned, Wicked Little Things. Bookmark the permalink. 2 Responses to Damned Kids!